There are two ways to advertise on TeamNetworks.Net. Ad Campaigns are covered below. Sponsoring is covered HERE. > TeamNetworks.net Ad Campaigns allow you to reach our members and guests through banner advertisements. > Create ads using our interface or upload your own images and use the interface to connect it to a link to your site. > Monitor the progress of your campaign in the management area once you have created it and edit selective aspects of it multiple times if desired. > Create an unlimited number of ads and/or purchase multiple units of CPMs or PPCs per each campaign. > We are a an interactive network where members are free to post on topics outside of the scope of the site mission attracting a wide variety of visitors as well as those attracted to our site's focus, Upholding the American Dream. > Advertising here will help to support the continuation of this site that you enjoy. We do not sell or trade information about our members as most sites do to help pay for the cost of operation and placing ads helps us to stay on line. > We increase the likelihood that a hit on your ad is a real person by blocking visiting ips with bad reputations and unbeneficial robots. > The majority of our thousands of pages will display your ad when it comes up in rotation regardless of which location block you choose. > You can use our advertising system to promote a business, website, events, charities, personal announcements or milestones, an idea such as your favorite quote, or almost anything your imagination can dream up providing it remains within our acceptable guidelines listed below. Rates are subject to change without notice. Rate changes will not affect ads already purchased. Future campaign opportunities may include CPM and/or PPC (pay per click) options. The following image shows an example of the pop up that appears when you select the position of your ad in the ad creation area. It is for illustrative purposes only and may not reflect the current effective rates shown above or the current blocks available. Current rates and block locations will always show up in the create ad area. If you cannot read the text in medium contrast areas highlight the text with your cursor, as shown where the red arrow points, for a clearer view. We reserve the right to disapprove of any ad at the sole discretion of the administration for any reason that we find it to be not in line with what we wish to promote or feel is appropriate for our members and visitors including reasons not listed specifically below. 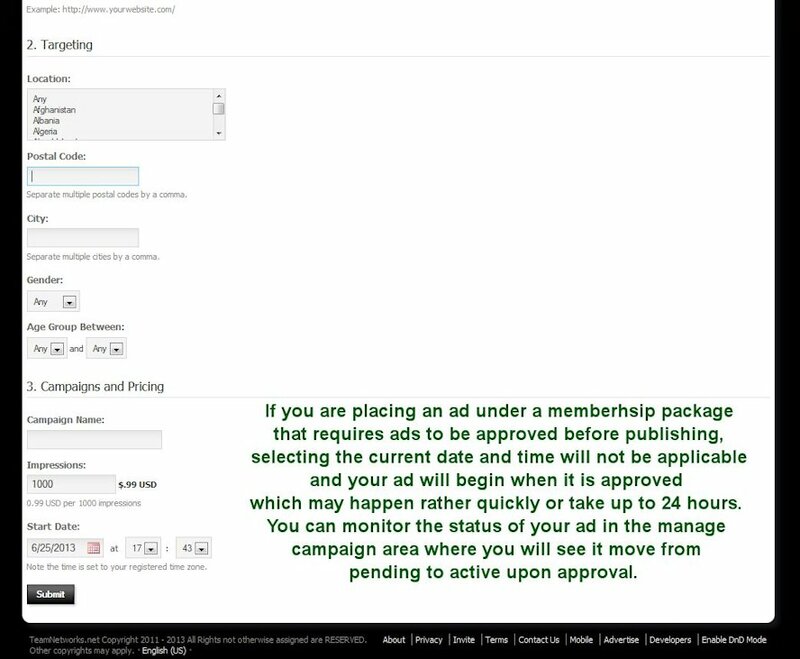 If you are placing an ad at a membership level that requires ads to be approved before they begin, your payment will not be accepted nor will your ad run if it is in violation of our policies. If you place an ad at a membership level that does not require approval before running, upon discovering inappropriate content, we will turn the ad off and contact you with your options. We especially welcome campaigns that promote the positive aspects of what you are advertising! *Hate based against any business, website, group, person etc. Reasons to reject an ad are not expressly limited to those listed in the guidelines above. Navigate to the advertisement creation and management page where you will choose to create or upload an ad for your campaign. If you choose to create an ad using our interface, start by selecting the position you want it to appear in before making color selections, uploading an optional image and adding text. Once you select your location, the site will begin building the ad at the same time you do in the preview pane where you may review your selections or changes as you build it. If you choose to include a logo or other image, it should already be sized accordingly and it will appear where the words [Image Placement} are shown by default. Not uploading an image for this space will cause the system to remove the bracketed words [Image Placement] before publication and better position your text evenly across the ad. In this illustration we have selected block four position which created the ad outline in the appropriate size, made color selections, uploaded an image to the ad, inserted a title, (is click-able) text , and a destination URL to which the click-able text will lead. If you upload an ad, be sure to check the (Select a Position) link first to see the sizes that are appropriate to upload for available blocks as shown under the pricing section above. A URL is required. If you don't have a URL that you want to direct to, for example because you are running a personal announcement, then please use http://teamnetworks.net or if you want to place an ad as a way to donate to our site and encourage others to advertise as well use ETC to send them to this page. In the upload ad space, you need only insert your image and add the destination URL if any before proceeding. The entire ad will be click-able. Whether you create or upload an ad, your next step is to select the details of whom your ad will appear to, for how many impressions or clicks as shown in the screen shot below. When you have completed your campaign creation, select to make a payment and be directed to our PayPal account. You do not have to be a member of PayPal to use the system. Once your payment is received, your ad will be turned on unless you are in a member level that requires approval first and in that case, approval can happen anytime thereafter up to 24 hours later. 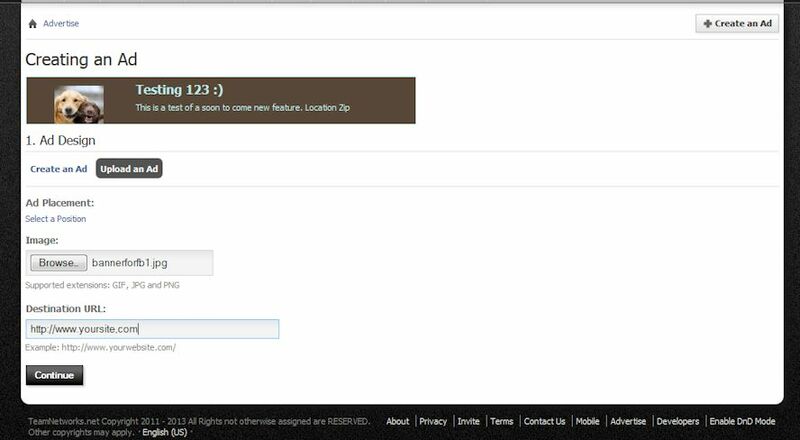 Look around the site to see what may show up on top of or beneath the blocks available as it varies per page. The site may change its color scheme from time to time. 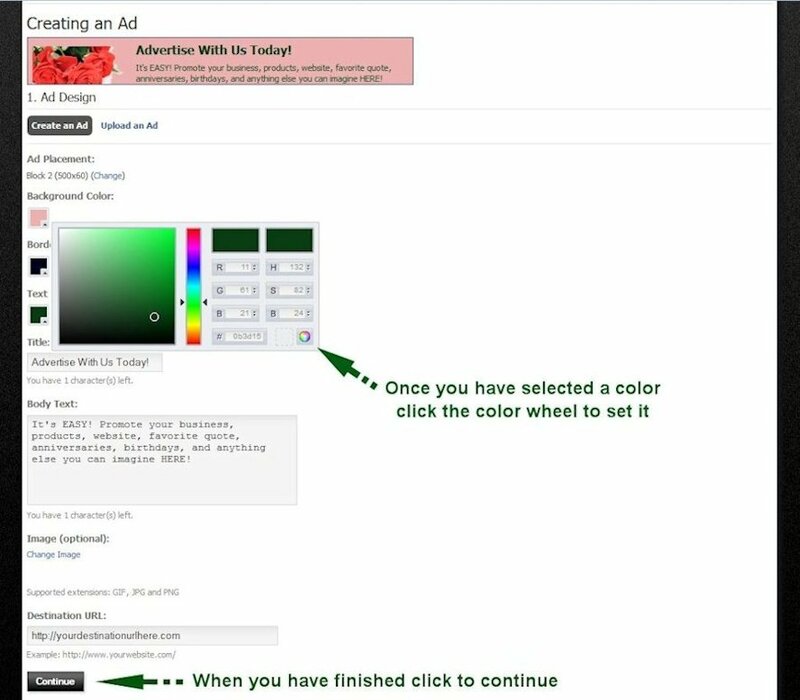 When creating an ad on site or choosing one from your computer, take note of the color fields that surrounds your ad after looking around the site. They may not be the same as shown in the ad position block. As shown in examples here the colors are black, white and charcoal, which may or may not align with current block colors as they actually appear. The design page where your ad will preview is white regardless of where you have chosen to display your ad. This especially affects how a white border may accent your design once placed on the site. You may like to start with a small number of views or clicks for your first ad to see how the system works and to monitor the current performance. From this you may learn approximately how long it takes to get for example a thousand hits even though it may vary widely for the next thousand due to varying traffic at the time and day your ad goes live. Another factor is how many other ads are rotating with yours in the same place. A low number of ads will cause yours to process much more quickly. We make no claim or guarantee about the quality of views or clicks that your ads may achieve due to ip masking, members who may not record accurate location information if any, a varying visitor to member ratio of viewers and other factors out of our control, nor do we guarantee the length of time it may take to achieve any number of views or clicks.